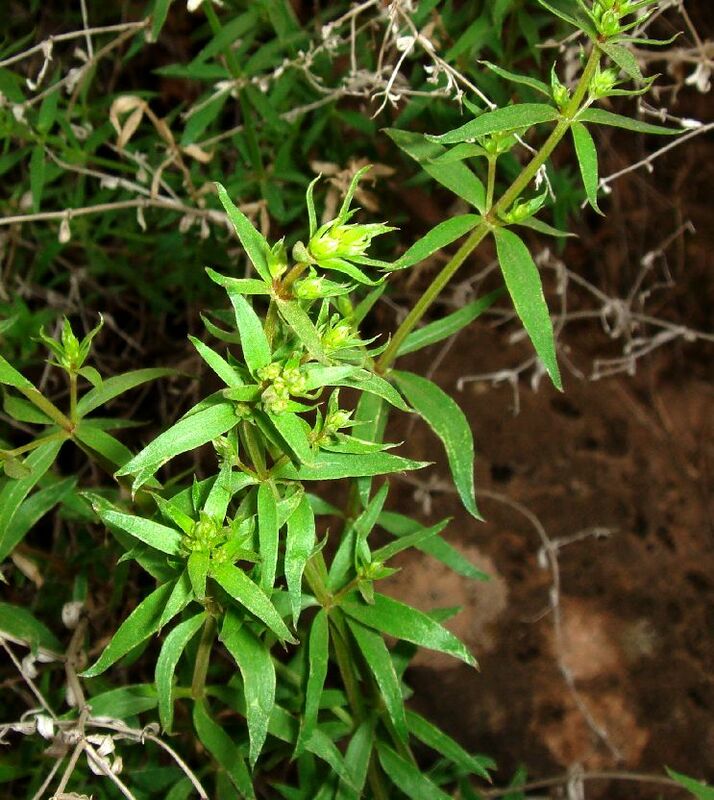 Galium munzii ssp. 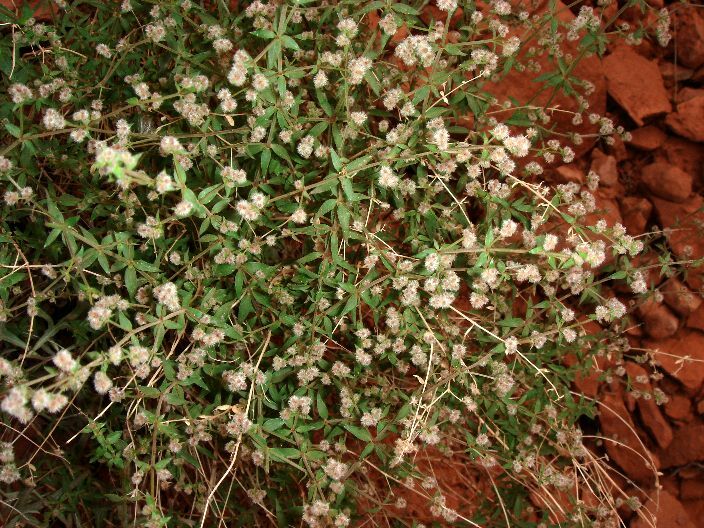 ambivalens is endemic to Arizona, found in just Coconino and Mohave counties. 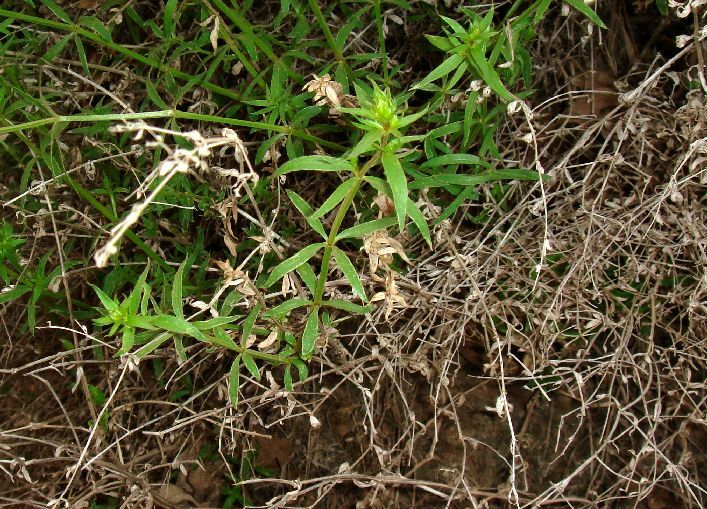 Identification status: No Galium determination can be considered secure without flowers and fruit. Unfortunately, I've hardly ever encountered specimens with flower and fruit in my April/May and August/September visits to the Grand Canyon. 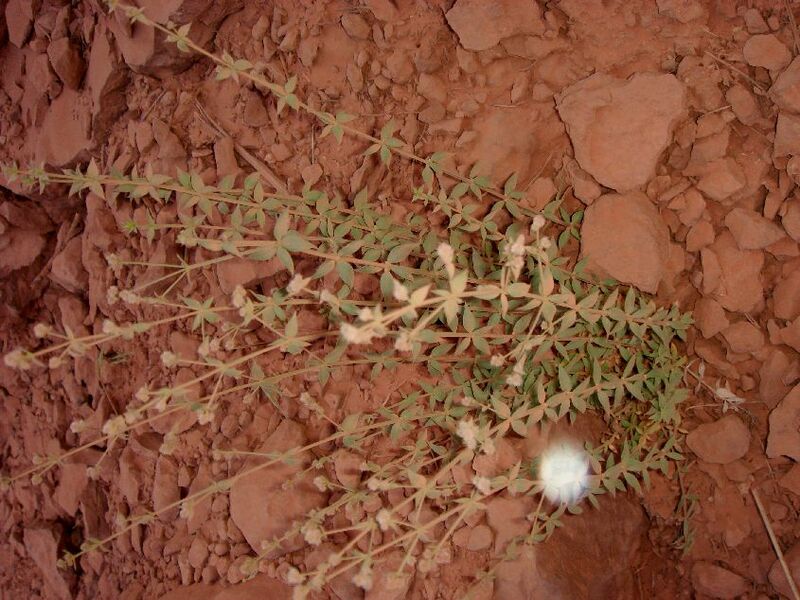 Instead, I've tried to use the vegetative appearance of the plants, along with the species present in this part of the Grand Canyon, to try to determine them. This may or may not result in reliable determinations. 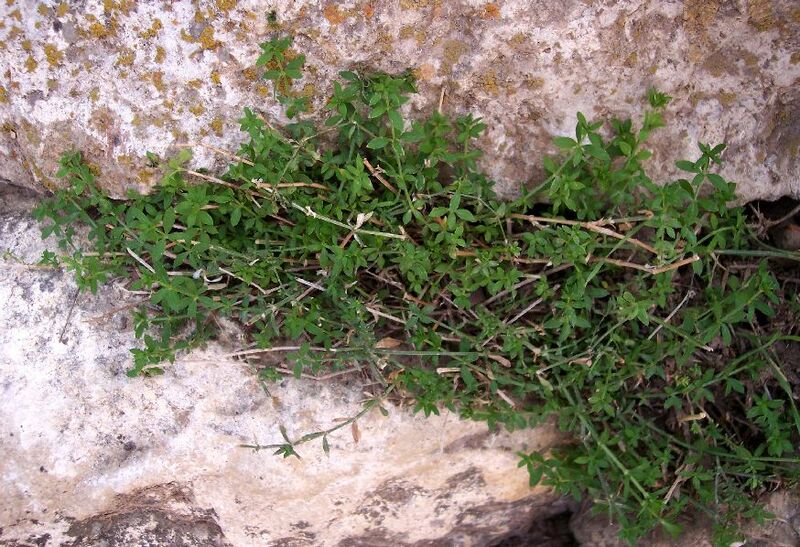 In the area of the Bright Angel and South Kaibab Trails, there are only four recorded Galium species. The following table gives some distinguishing characteristics of each one. G. munzii 5200-8200 Perennial with woody base, leaves lanceolate or ovate, tapering to acute apex. 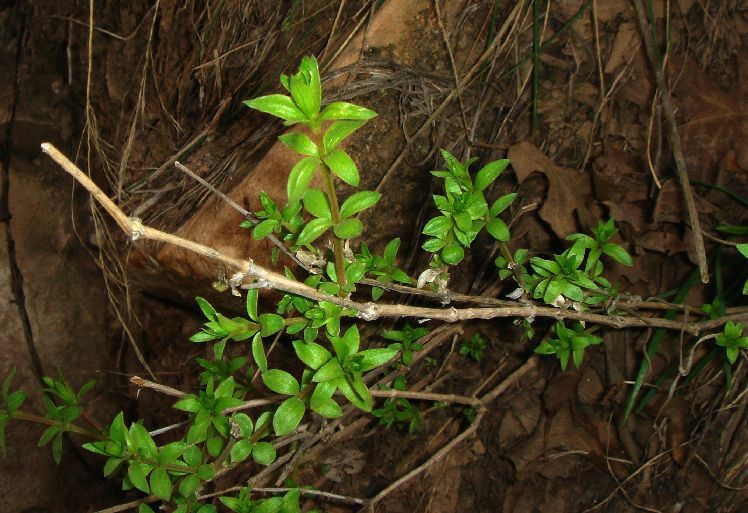 All taxa have leaves in whorls of 4 except for G. aparine, and all taxa have white, yellow, greenish, greenish-yellow or reddish corollas except for G. wrightii. 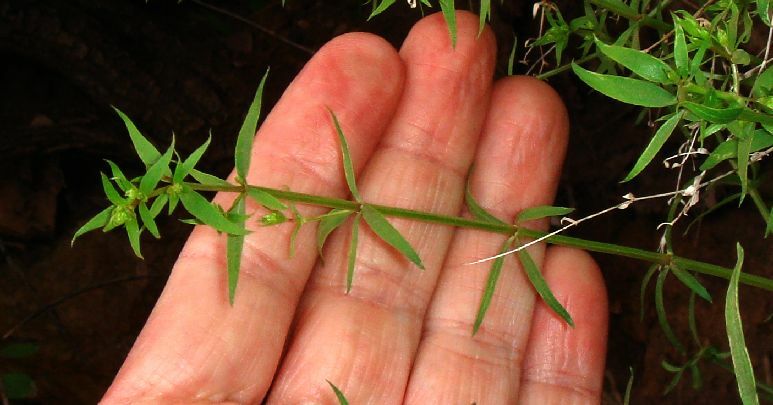 All taxa have leaves roughly the same length, ~7-20 mm, except for G. aparine, which has leaves of 13-31 mm length. 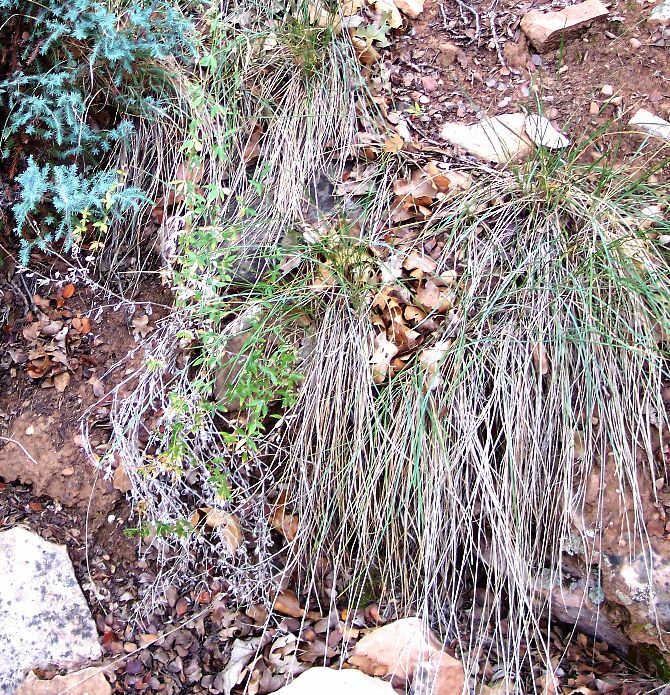 The elevations are from the 1987 Grand Canyon Flora by Phillips et al; the characteristics are from the Galium treatment by Dempster in the 1995 Vascular Plants of Arizona and from McDougall 1964. Although Dempster places only ssp. 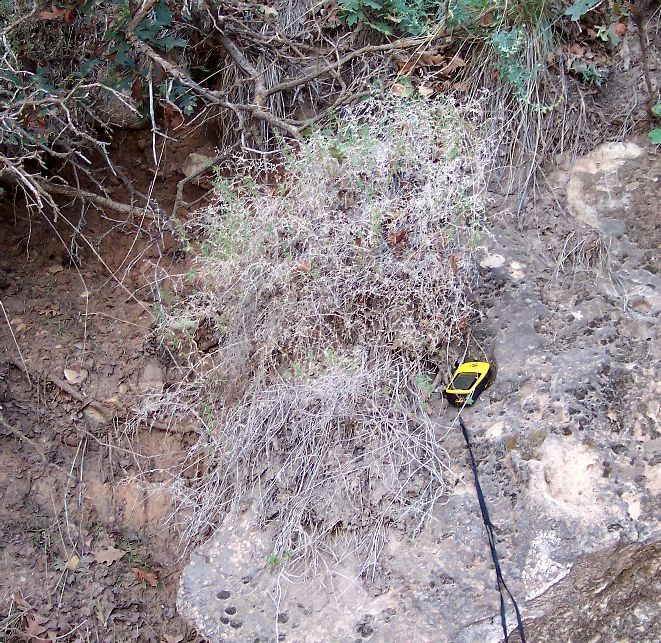 ambivalens in Coconino County, Phillips et al places ssp. munzii there, and online vouchers exist from there as well. 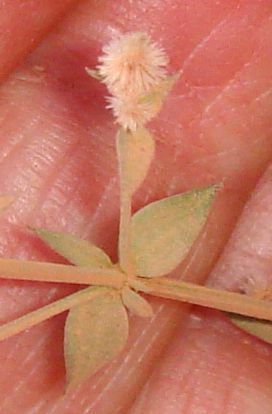 G. munzii ssp. 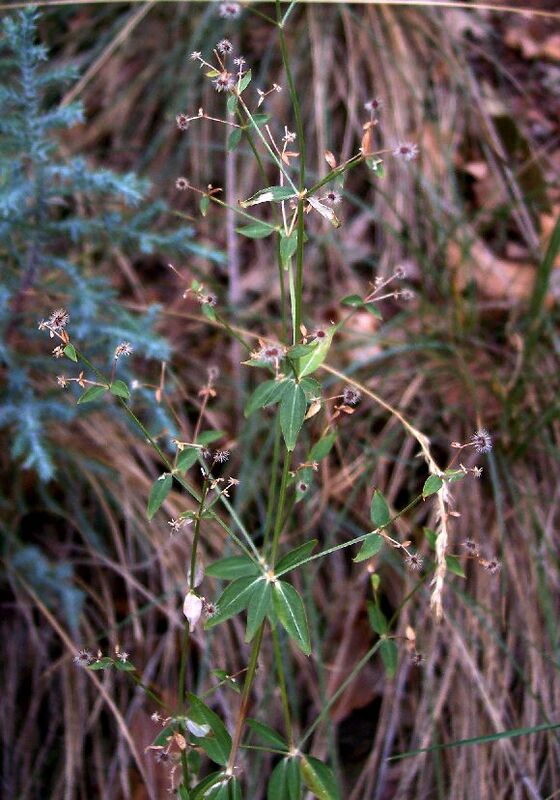 ambivalens was called G. watsonii in Kearney and Peebles and in Phillips et al. 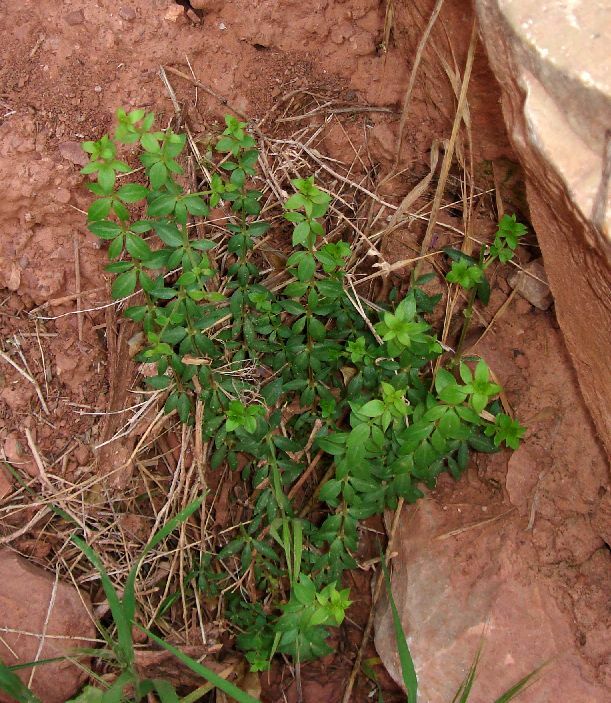 All of the plants found so far on the upper Bright Angel Trail are perennials with narrowly lanceolate to ovate glabrous leaves, which would make them Galium munzii ssp. ambivalens. 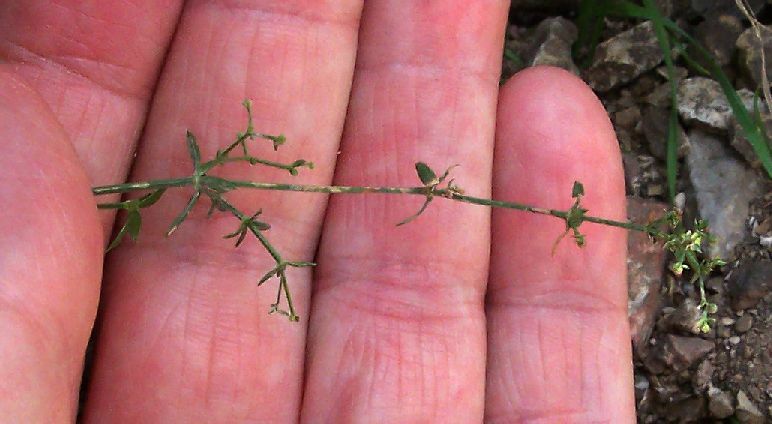 However, there is such striking variation in the leaf shape, with the narrowly lanceolate plants having almost linear leaves, that I am not sure whether those plants are this determination. 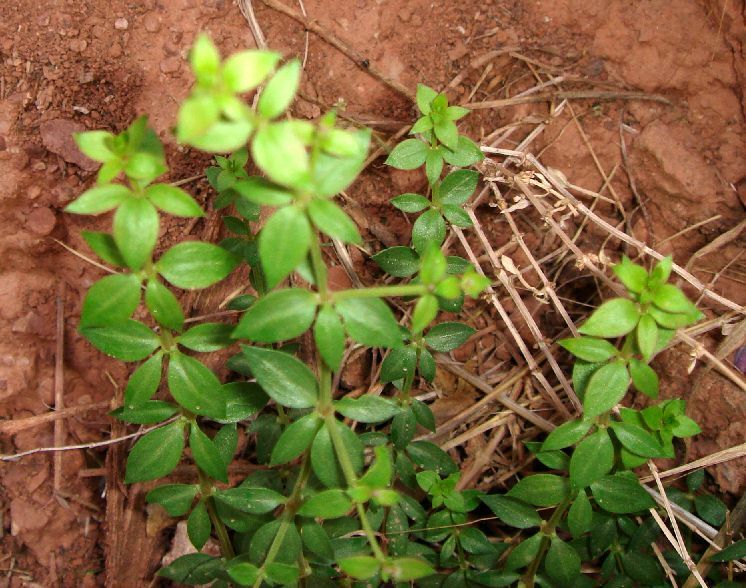 The plants with almost linear leaves also seem to have a leaf base that fits the description of the leaves of G. wrightii. See the pictures below, and let me know if you think these fit another taxon better. 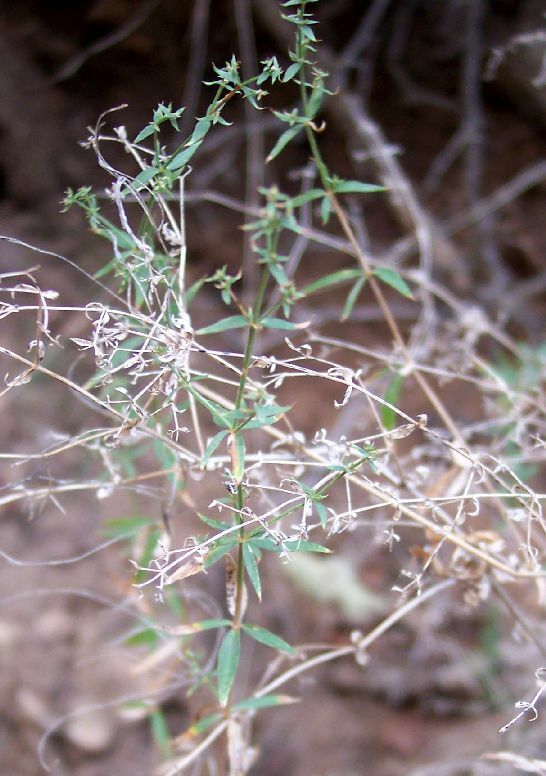 See also Plant Species of the South Kaibab Trail: Wright's bedstraw, Galium wrightii; Plant Species of the Bright Angel Trail: common bedstraw, Galium aparine; and Galium stellatum ssp. eremicum from the Borrego Desert. From a SEINet search on 2 September 2008, there are 14 vouchers of G. munzii from the Coconino County portion of the Grand Canyon. Five of those vouchers are determined as ssp. ambivalens; the rest are determined only to the species. Four additional vouchers are from the Little Colorado River; all are determined as ssp. munzii. One voucher is from this trail, determined just to the species: Along Garden Creek. Note that there may be additional vouchers at other herbaria not available through SEINet. 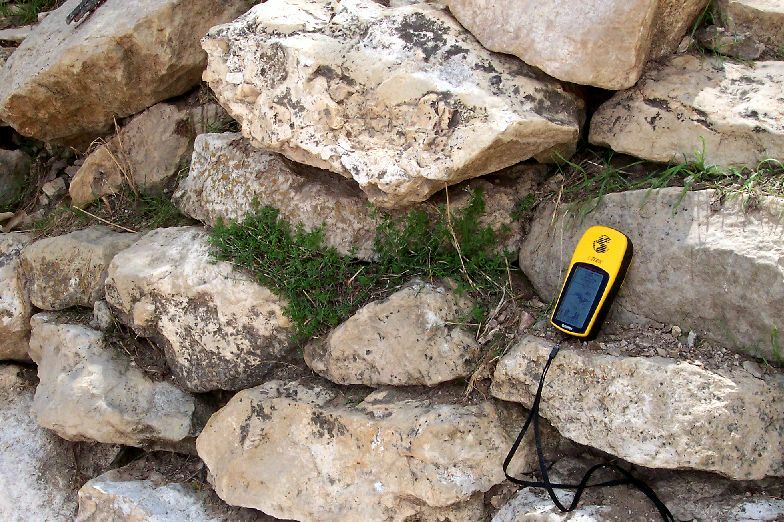 First occurrence on Bright Angel Trail: mile 0.59, elevation 6477 feet (1974 m). 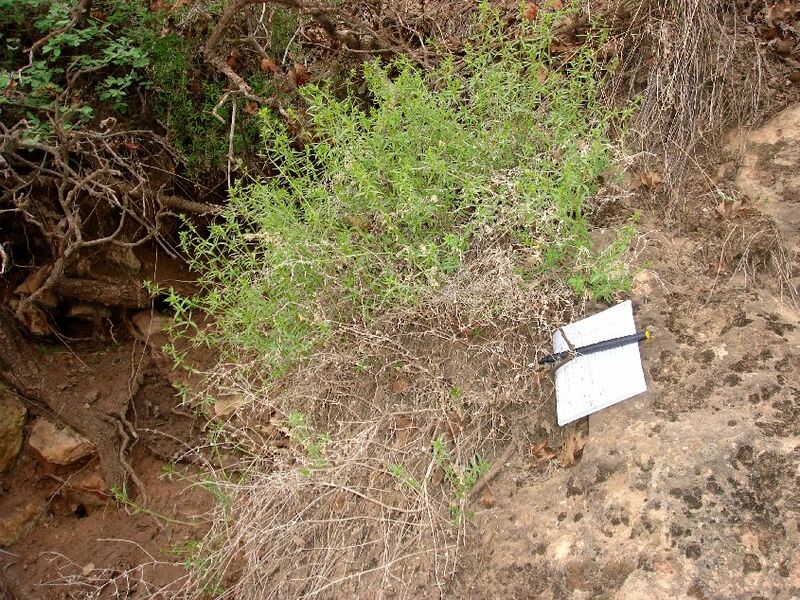 Number of plants along Trail: at least 40 plants were found in at least 9 different locations in May 2008.